In the mid-1720s, George I commissioned architect William Kent to redesign his state apartments at Kensington Palace. At the centre of these new quarters was a room that came to be known as the Cupola Room. Unlike other architects of the time, Kent was involved in every aspect of the room’s design, including the interior decoration and furnishings. He designed this room to resemble a four-sided Roman cupola (a rounded dome). 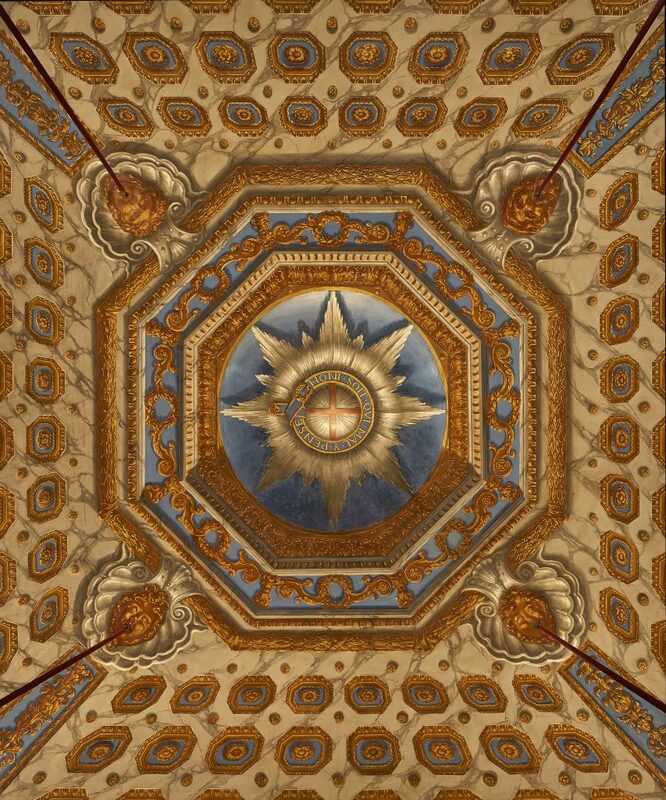 The ceiling is steeply curved, surrounded with trompe-l’oeil designs, and finished with the Garter Star at its apex. Today, the room’s design centres around one object: an ornate, sculptured musical clock surmounted on a grand pedestal, called the ‘Temple of the Four Great Monarchies of the World’. It was purchased by Princess Augusta in around 1743 and placed in this room soon after. This clock was designed by Charles Clay, a clockmaker who specialised in extravagant musical clocks in the form of miniature temples. They would often play tunes from popular operas of the time. Clay arrived in London around 1720 and set up in premises near St. Mary-le-Strand Church. By 1723 he had been appointed Clockmaker to His Majesty’s Board of Works. 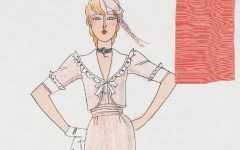 Though few could afford to buy one of Clay’s designs, for 2s 6d a ticket would allow visitors into Clay’s own house in the Strand to view his latest work. On this particular model, Clay spent 20 years of his life, and died before it was completed. Three days before his death, he ‘order’d a Musical Machine, which had cost him about 20 Years Time, and upwards of 2000l to bring to perfection, to be beat to Pieces, and entirely destroy’d to prevent the Expence of the Time and Money of any one who should attempt to finish it after his death’. 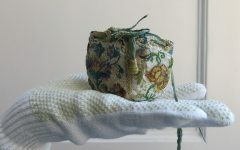 His wife clearly did not follow through with Clay’s wishes of destroying the clock, as it was finished by clockmaker John Pyke and was advertised as for sale by Clay’s widow in November 1743. 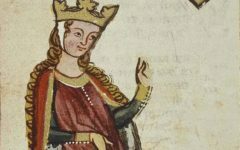 The name of the clock, the ‘Temple of the Four Great Monarchies of the World’, refers to the four great empires of antiquity – Assyria, Persia, Greece and Rome, which are represented on each of the faces of the clock. The faces are decorated with painted allegorical scenes by Jacopo Amigoni, and reliefs in silver by John Michael Rysbrack. At the corners of the temple sit four bronze statuettes, also representing the four great monarchies of the world. They were created by the French sculptor Louis-François Roubiliac and the clock is surmounted by Roubiliac’s figures of Hercules and Atlas supporting the globe. Though the clock’s mechanism to play music has now stopped, it once produced compositions by George Frideric Handel, Francesco Geminiani, and Arcangelo Corelli – all contemporary and popular composers from this time. In December 1743, the clock was available to view at John Pyke’s premises near Gray’s Inn in London. 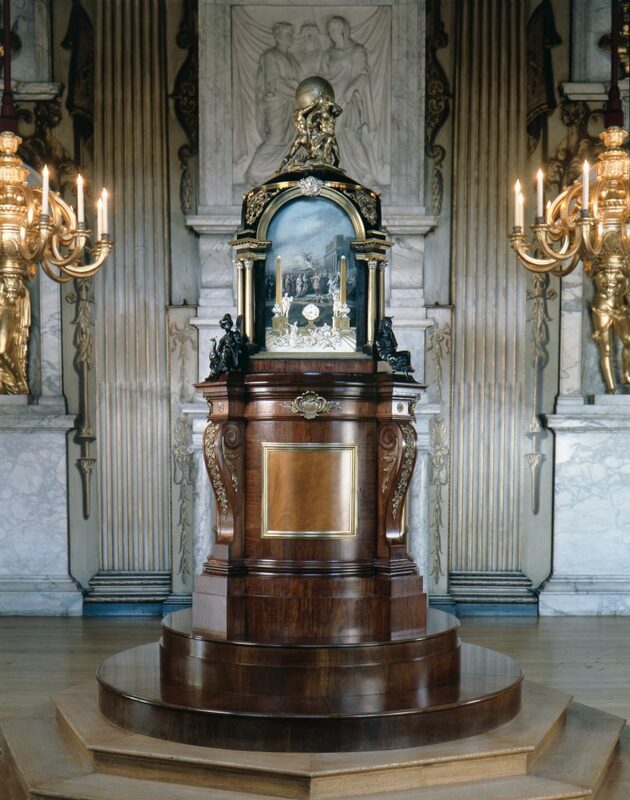 It apparently cost more than £4,500, and in around 1743 the clock was acquired by Princess Augusta. 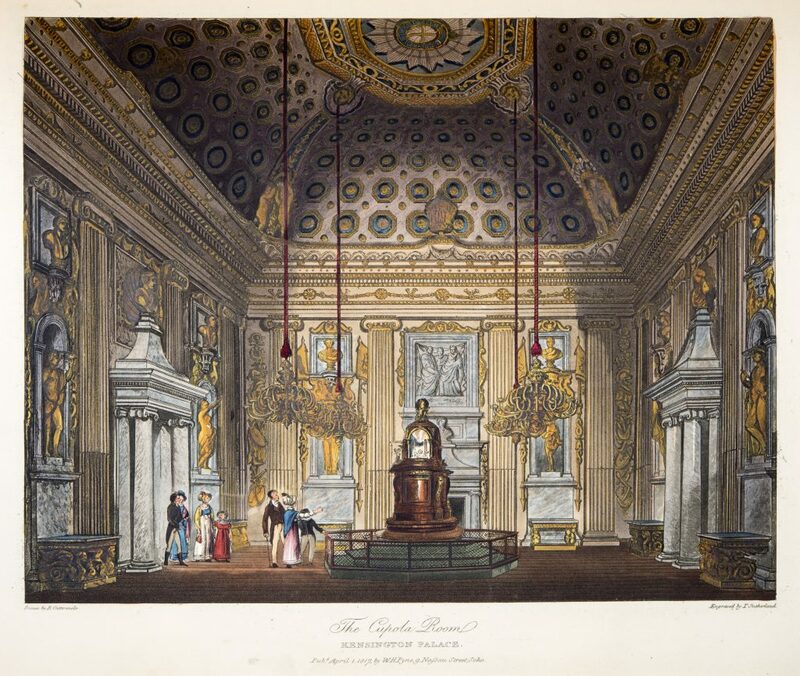 ‘The Cupola Room, Kensington Palace’, Thomas Sutherland (1785-1838), 1819. In the year that this view was first published, the room was the setting for the baptism of Princess Victoria (the future Queen Victoria), although the clock and not the gold font is depicted here. 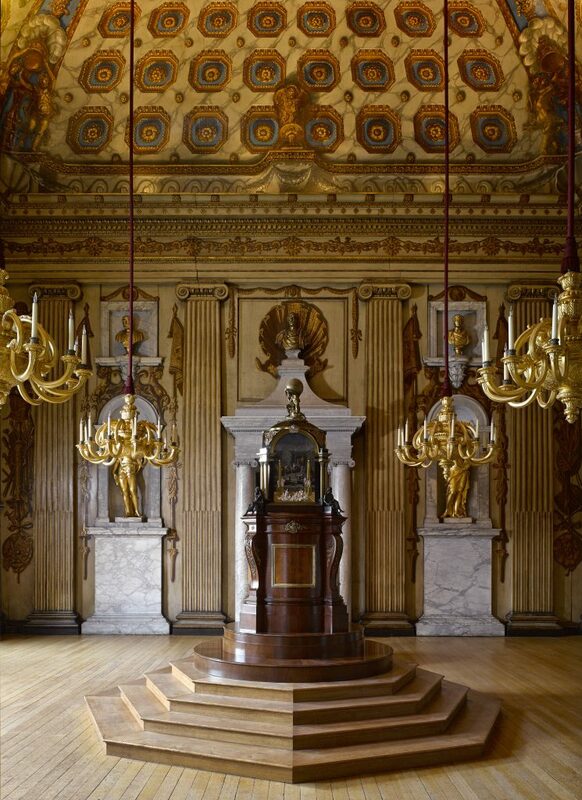 The clock was placed in the Cupola Room at Kensington Palace during the reign of George III. It was removed and put in the King’s Drawing Room in the early nineteenth century, during which time, in 1819, a gold font was installed temporarily for the christening of Princess Victoria. In 1994, the clock was reinstated in this room, on a plinth that had been re-created after an eighteenth century engraving, returning this elaborate finishing touch to Kent’s sumptuous decorative setting. Would it be possible to restore or repair the musical mechanism to working order?